About: Empire K9 is a full service dog training company that specializes in both obedience training and behavior modification. Empire K-9’s 5,000 sqft Training Facility is located on 15 acres in Nassau, NY. Just minutes from Albany, NY the facility includes nature trails, training fields, secure exercise yards, 2 acre swimming pond, heated floors and more! Trainer Bio: Heading up the training, James Pearson incorporates over 15 years of extensive and diverse experience into training your dog. Having worked in the U.S. Army as a Military Police Officer specializing in K-9 handling and training, James brings this breadth of expertise with him to Empire K-9. 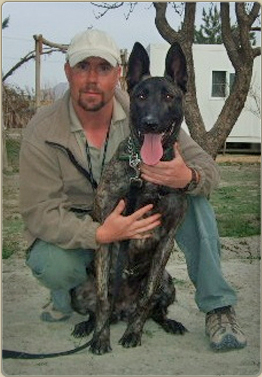 James has worked on several government contracts throughout the world as a consultant in the field of working dogs. These agencies include but not limited to Department of Defense, Department of State, U.S. Customs and Border Patrol, Foreign Governments as well as several large Private Security Companies. In addition to his professional working dog background, James has worked extensively as a Training Consultant and Behavioral Specialist with individual clients and their pets. His focus has been on behavior modification and over the course of the past 15 years, has fined tuned an approach that is both effective and efficient. James has a successful track record working with all breeds and temperaments. James has attended and graduated from many academies and holds several certifications such as….. Master Dog Trainer, Military/Police K-9 Handler, Police K-9 Trainer and Instructor as well as certifications in Pet Dog Training and Behavior Modification. James takes the same training approach to training Pet Dogs as is used to train Service Dogs, Assistance Dogs, Seeing Eye Dogs for the blind, Military and Police Working dogs. He will fully train your dog for you then transition that training to you. All training is done in a manner that will last the life of your dog without you having to allocate hours of training time each week to maintain the training. Philosophy/ Approach: At Empire K-9 we believe a dog trainer should actually train your dog rather than tell you how to train your dog. We are not “Obedience Instructors” and will not repeat information from a book and leave “you” to do all the work on your own, often ending in failure. Unlike most trainers, we understand that no two dogs are the same. We understand that dogs have different learning abilities and thus require individualized motivators. By taking a combination approach to dog training and integrating various reinforcement techniques we can find what best trains the dog without sacrificing trust. Using limited techniques or taking a “cookie cutter” approach to dog training will leave you with limited ability and disappointing results. Instead, we use a variety of methods/ techniques and training equipment combined with owner education to ensure success in training with lasting results. We bridge the “Communication Gap” that inherently exists between us and our canine companions while at the same time providing command and control mechanisms that will be used to navigate the “human environment” with your canine companion. Our approach allows us to bridge the canine-human “communication gap”, train obedience commands, modify behaviors and proof the training around various levels of distractors and in various environments in a fraction of the time that would be needed with “classes”. Through proper obedience training and owner education we can maintain balance within the home and prevent future problematic behaviors from occurring allowing you to enjoy life with your canine companion. Let’s do this right, the first time! At Empire K-9, Inc we guarantee success. Our professional dog trainer will work individually with your dog to make sure that we meet your goals. Unlike other companies, we can customize our services to best suit your schedule, your goals and your family. Training dogs is our profession not our hobby. Our history and reputation is one of a kind and we are more like a family than a business.